Heidi is turning six this month and has now outgrown the softplay parties that she would usually have. When Pikku in Gosforth invited us to road test their pamper parties we knew this would be the perfect way for Heidi to celebrate her birthday with friends. 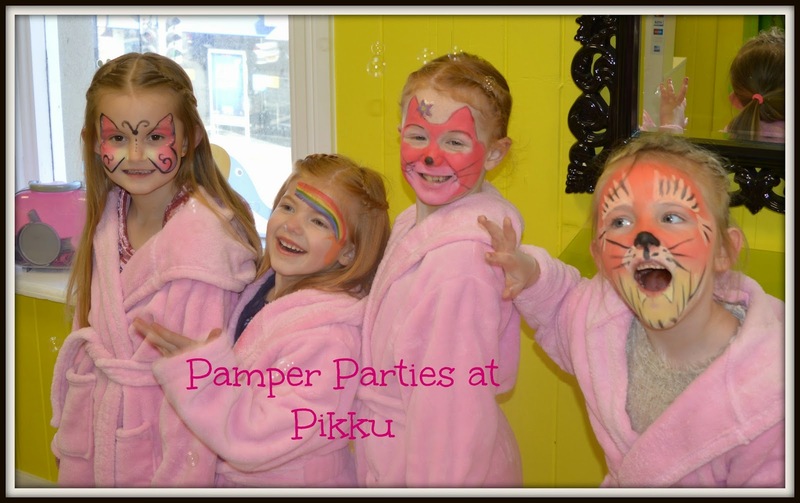 Pikku Pamper Parties start at just £15 per head and this allows you exclusive use of the bright and child friendly hair salon upstairs. You are in the capable hands of Trish and Laura who are both mums themselves and their experience with children really shows - the girls loved them and thought they were great fun. Pamper parties are tailored to specific requirements but include party food and unlimited juice plus, free invitations and party games with prizes. Your party guests can sample a selection of pampering treats from face painting, mini manicures and hair styling. Heidi and her friends were first of all asked what sort of music they liked (One Direction!) and their album was the soundtrack to our party. They were then all given snuggly pink bathrobes and asked to jump aboard the special pink cars to have their hair plaited. All of the girls were super pleased with the results and loved taking it in turns to sit in the car and watch Princess movies on the in-car ipad. The girls could choose between a selection of nail varnishes (but they all decided on pink) that were fast drying. Heidi never has her nails painted at home so this was a real treat for her. This was the highlight of the party for the girls - they LOVED getting their faces painted and could choose from a selection of designs. We ended up with a cat, a butterfly, a rainbow and a tiger! Finished off with a little bit of glitter. All of the face paint can easily be washed off that evening with soap and water or a baby wipe. Between pampering there is a craft section set up on the floor for the girls to use their imagination and design their own make-up using glitter pens. The girls could help themselves to a party tea and unlimited juice throughout the party. Specific requests and dietry requirements can be catered for - simply ask when booking. The party ended with dancing and party games led by Trish and Laura (who ensured everyone won a prize too). It was then the girls' turn to play hairdressers as they split into two teams to style Laura and Trish's hair (very brave) and were rewarded with a Pikku balloon each for their efforts. Thank you to Pikku, Laura and Trish for a fantastic party. The girls had an absolutely wonderful time and were in very capable hands. I love that they have created these special memories together and it really was a little girls dream party. I think the smiles on everybody's face really says it all. 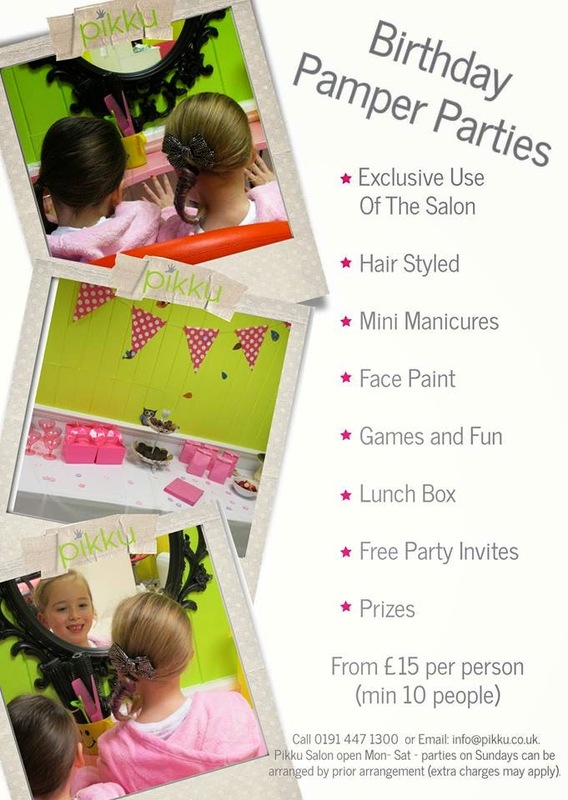 Pikku Pamper Parties start at just £15 per head. You can find out more here, phone 0191 447 1300 or email info@pikku.co.uk to discuss availability and book. We were provided with a complimentary birthday party for the purpose of this feature. For more family fun ideas please Follow North East Family Fun on Facebook.